Hassan Rouhani, the failed president of the bankrupt Iran, visited Switzerland to beg saving JCPOA. No water or electricity, poverty are the theocracy's outcome. Hassan Rouhani spent four days in Europe, visiting Switzerland and Austria. At home, Rouhani faces chaos and is desperate to see the Europeans so they find him an impossible solution to his problems. Both visits were done in the general indifference, achieve nothing, and are already forgotten. 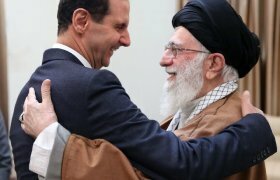 However, how they raise a few points of interest on Iranian politics; how the clerics’ vision of the world has brought Iran to its knees, and how they are desperate in seeking others to clear the mess for them. 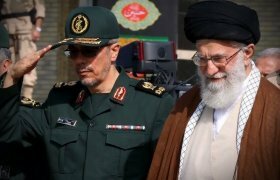 Iranian ayatollahs are facing rough times that will put an end to their reign. How long it will take to throw them out or what will replace them, is anybody’s guess. On money matters, the exchange mechanism of the rial against the USD and the euro is in total disarray. Cut off from hard economic facts, the official rate is 42,000 rials for one USD, and there are too many restrictions to obtaining them legally. The underground exchange rate is twice as much, and if the buyer is in a hurry, up to 90,000 rials for a USD can be earned. For imports, only hand-picked economic sectors can buy the USD at the official rate. Traders have been quick as lightning to sell the very same goods and services with a tag price based on the unofficial USD. Traffickers and profiteers, helped by the regime’s men – if not the very same ones – are mushrooming in number; hyperinflation is on its way. Since last January, people have asked for their unpaid wages. Here and there, towns are on general strike. Trade and transactions are at their lowest volume. Bazaars are often closed. The shop owners refrain from opening their business; they are either holding banners in street protests, or in want of customers – they cannot be bothered to leave home. Workshops and small factories go bust on a daily basis, and larger entities are laying off workforce. Women are first to go. Yet, hundreds of scattered protests have far less impact than a few organised larger ones. There is an atmosphere of the 1978 strikes. However, today there is no organised counter power to unite them and turn the demands to a collective powerful force, as the clerics manage the protests against the Shah. The Iranians – leaden with irrational superstitious beliefs – are waiting for a Messiah, another dictator, to save them from themselves. The shortage of water and drought are on everyone’s mind and have seriously affected farmers, many of whom are making themselves heard loud and clear. 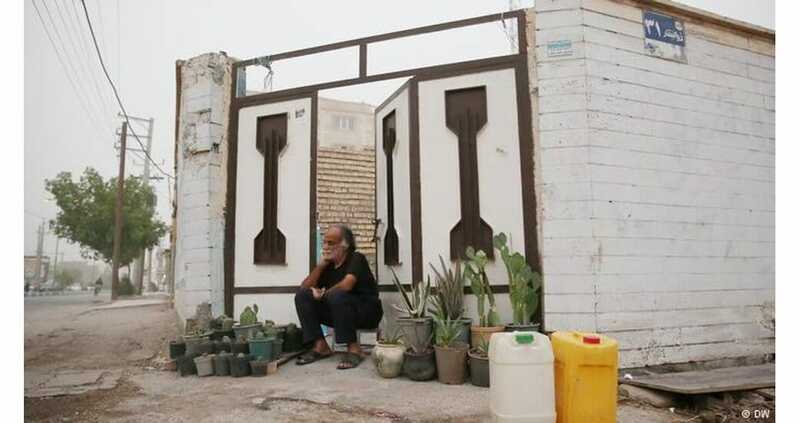 Salty, unsafe water runs out of taps in large towns of the Khouzestan province. The numbers of tankers selling drinking water of dubious quality are soaring in all villages, towns and cities across the country. The electricity supply is randomly cut off, putting out hundreds of business. If one considers the geographical size and the demography of Iran, the nuclear power plants – the cause of so much international ado – produce less electricity than a battery to light a lamp-torch. Since the USA have withdrawn from JCPOA, the promises of foreign investment, printed on tens of MoUs, have evaporated into thin air, and the European companies that have opened up branches in the country have pulled out. The little overture of JCPOA prolonged the life of the theocracy for three years on false hopes. Donald Trump, no matter how much he is erratic, bigoted and unfit to be president, by withdrawing from JCPOA has only added to Iran’s shambolic state. The responsibilities and the causes of the country’s disarray result from decades of domestic mismanagement, dogmatism and repression. 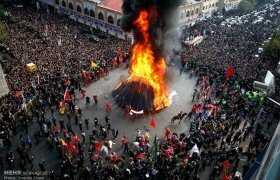 No money, no trade, no water, no electricity, heavy pollution, spreading poverty and criminal acts, bitterness, spite, ill will and a spirit of vengeance – these are all the outcomes of the Iranian theocracy. At present, JCPOA is dead. The other signatories to the agreement butter up the Iranians with hollow promises. The secondary sanctions imposed by the USA loom on the horizon of any entity with an active branch in the USA. The companies have to choose between their American interests and their wish to invest in Iran. If they choose the latter, they are bound to face heavy fines and put their activities in the USA in jeopardy. A drop in profit from their commercial activities in a difficult Iranian market leaden with ideology and mismanagement cannot be compared to the heavy losses they face in the USA. For the Europeans, D. Trump is an unreliable and distasteful ally, but the USA is still an ally they are bond to. The Iranians’ demand to cut off the bond and fully back them up against the USA is unrealistic. In the past forty years, Iran has cut itself off from the major economic and political alliances which have shaped the world today. All the things that needed to be done to evolve with the changes that have been taking place since the 1980s have been buried under religious bigotry and the country cannot catch up overnight. Despite all the alarm bells tolling on the domestic scene, and the international orange lights turning red, the men in Tehran are deaf to the sounds and blind to realities. 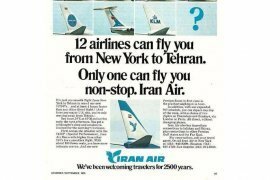 Like parrots, they repeat the same phrases of 1979. By a combination of ignorance and the denial of realities, they only have faith in their own vision and ideology, no matter how false they are proved to be. Arrogant, and xenophobic, they despise the mildest critic and oppress those standing up to them, the Iranian first. The total domestic chaos of the past years has been the result of contradictory declaration followed by no action or disastrous decisions, due to incompetence and religious dogmatism. From the cacophonies heard, the words JCPOA, enemies, and Islam stand out ad nauseam. 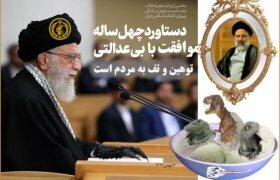 The clerics wish to boss Europeans about on their terms against the Americans, making it clear they would face the Iranians’ ire otherwise: We will develop more missiles, we will have 190,000 more atomic centrifuges, we will show our strength to our enemies, we will destroy Israel, we will burn the JCPOA ourselves. Of course they can do harm here and there, but have not enough power or money to carry out their aims. The ministers, deputies and ayatollahs quarrel among themselves, and give the most extraordinary and aberrant explanations for current issues amid lies and rumours. If the USA has one ayatollah Trump, Iran has far too many of his sort. The Trumpian and the Ayatollah-ian worlds share the same values by exploiting the crowd and a having a comfy feeling of being above the law. Since 1979, Hassan Rouhani, the Iranian president, formerly a deputy in the 1980s, and a key official for decades, is one of the key contributors to the havoc reigning in the country. He flew to Zurich feeling a false strength with exaggerated postures and overblown words, trailed by an Iranian IRGC General in full uniform. He banked on the warmth of his earlier European visits in which his past was overlooked. In 2014, he was patted on the back in World Economic Forum, Davos. In 2015, as soon as JCPOA was concluded, he walked along red carpets in Rome and Paris. On these occasions, the European elites and technocrats, followed closely by the media, displayed hypocrisy, short-sightedness and greed by buttering him up. In early July 2018, things were different. The visit was ill-timed amid the major difficulties that Europeans faced internally or that were created internationally by the blackguard Donald Trump. Internally, Europeans were on the verge of imploding if they did not unite fast. Internationally, they were garden gnomes no matter how much the populist governments believed in the power of their own sovereignty and in the hyper-inflated egos of the far-right leaders. In this context, neither the polite Swiss nor the starched Austrians had much patience for the bragging Rouhani and his propaganda. 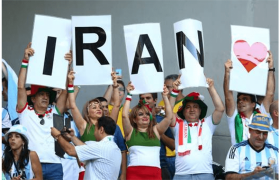 On 2-3 July, when Rouhani visited Bern, what mattered to the Swiss was the fate of their football team, in the World Cup. The Swiss were absorbed in speculating on their team chances and the opportunity of watching the Switzerland–Sweden football game live at their workplace. The media coverage of Rouhani’s visit was kept to inside pages or the broadcast of a last clip in home news. No media outlet bothered to consult an expert for an in-depth analytical interview. If Rouhani expected to gain something from the Swiss, he was totally out of tune. The protocol was a thorny point as always when receiving a fussy Islamic Republic of Iran delegation. In fact, receiving them is an excruciating and exasperating experience. They have little respect for their hosts. Rouhani’s aids wanted to enforce the Iranian protocol in which a man refuses to shake hands with a woman. Since a senior Swiss minister and a former president, the respected and liked Ms Simonetta Sommaruga, was to participate in an official meeting, to the irritation of the Iranians, the Swiss diplomatic protocol banned all handshaking, except one between the Swiss president, Alain Berset, and Hassan Rouhani when he landed in Zurich. Did the Iranians ask the Swiss women to wear the hijab too? Maybe they had the cheek to do so, maybe not. However, the Bellevue Hotel, in Bern, which hosted the Iranians, had to temporarily remove or hide paintings or sculptures showing naked or partially dressed people, so as not to offend the conservative Islamic morality. The hypocrite conservative Islamic moralisers joined forces unashamedly with Bashar al-Assad to gas and bomb civilians, but they take offence seeing an artwork. Rouhani’s weakness was crystal clear during the press conference held with Alain Berset. The contrasts between the two men were obvious. Alain Berset, softly spoken, unassuming, courageous in a prudent way, is a genuine product of the decentralised and complex Swiss direct democracy in which a collection of faiths and minorities live peacefully, conversing in four languages. Switzerland, tiny in size and bereft of natural resources, benefits from a healthy economy and a banking system that has weight internationally. Hassan Rouhani, in his Shiite cleric outfit, turban and toga, represented the heavily centralised theocratic autocracy in which ethnic or religious minorities, even Muslims of different beliefs, are repressed. Elected in rigged elections and vetted by the Leadership, Rouhani is the sly, pretentious puppet of a failed and bankrupt oil-producing and Islamic country. The press conference started with the usual babble on mutual friendship. Before long, Rouhani behaved as if he was addressing a bunch of hand-picked Islamist followers that would applaud when cued. He ignored the fact that Switzerland is a neutral country and, as such, has represented the USA’s interests in Iran since the closure of the American Embassy in 1979. With a monotonous voice, he attacked the USA’s policies, preaching first-hand propaganda as he would in Tehran. Off-topic, he praised Iran’s migration policies which allowed the Afghan migrants to be looked after with utmost care and benevolence, thus criticising the USA’s inhuman policy in separating the migrant children from their parents. No one in the Swiss audience believed a word he said about the comfortable state of migrants; the black Iranian record on the immigrants, especially Afghans is a proven fact. Further, he branded Trump’s withdrawal from JCPOA as a violation of international laws and the USA’s blind sanctions as the greatest human rights violation imaginable. These were words that drove the Iranian deputies into an ecstatic state, but did not stir the placid audience of the Bellevue Hotel in Bern. Rouhani went on about the Zionist regime of Israel, considered illegitimate by the Iranian clerics, and whose activities threaten the security and peace in the region. Further, in covered words, he threatened to close down the Strait of Hormuz: It would be meaningless if Iran cannot export its oil while others in the region can. Do this if you can and see its consequences. This point was the only one to be blown up and embellished in the reports published by the Iranian media the next day, and be highlighted in the upcoming Friday prayers. The Iranian papers omitted to report that Alain Berset stood his ground on the Iranian human rights issues, and had the final word by objecting to Rouhani’s point on Israel: This is a perfect example of a point where we have significant differences. Rouhani’s gains from Switzerland were poor: a clear but expected commitment by both states to the JCPOA deal negotiated in Switzerland, an insignificant land transport agreement, and two miserable declarations of intent on cooperation in health and science. A few days before Rouhani’s visit to Austria, an Iranian diplomat based in Vienna was arrested in Germany in relation to a planned but failed bomb attack in France. The Iranian Ambassador was summoned for explanation to the Austrian ministry of foreign affairs. This was a thorny diplomatic point for the Iranian foreign minister, Mohammad Javad Zarif, part of Rouhani’s delegation. As for D. Trump, he is an aficionado of twit-diplomacy. Short of calling the event fake news, he tweeted: How convenient: Just as we embark on a presidential visit to Europe, an alleged Iranian operation and its “plotters” arrested. Iran unequivocally condemns all violence & terror anywhere, and is ready to work with all concerned to uncover what is a sinister false flag ploy. The case overshadowed H. Rouhani’s visit. European media outlets covered the foiled plot, hardly mentioning his stay in Vienna. The Austrian PM, Sebastian Kurz, was unimpressed by Rouhani’s declaration on Israel’s illegitimacy and in many clear statements he stood by his country’s politics toward Israel: unconditionally committed to the security of Israel and its citizens. He also showed his distaste for the Iranian human rights record. At their joint press point, Rouhani sulked during Kurz’s declarations, then he went on a rant about the Yemen war (Iran to free its people from foreign pressures), the Syrian war (Iran’s aim only to hit Daesh/ISIS). Then, he added: If Europe has a debt to the Jews, it does not concern Iran. Jews are indebted to us since Babylonian times. No one reacted to his plain lack of diplomatic tact. Something else about Iran amused commentators beyond the bothersome Hassan Rouhani, the chubby face of terrorism, as a local called him. On July 2, the head of the Civil Defence Organisation, Brigadier General Gholam Reza Jalali, said that the drastic drop in rain and snowfall in Iran seems suspicious and that foreign interference is suspected to have played a role in climate change in Iran. He said that the persisting drought and water shortage in Iran is a consequence of the theft of clouds, bearing rain and snow, by Israel and other enemies of the Iranian people. They prevent rain and snow from falling. He concluded: The highlands of Afghanistan to the Mediterranean were studied, and the result was that all the highlands with the height of over 2,200 meters were covered with snow while our highlands were arid. The cloud-thieves theory could have been another fun joke to remember if it was not for the fatal shooting of a protester by the security forces, in Khorramshahr/the Khouzestan province. All he wanted was drinking water. Iran unequivocally condemns all violence & terror anywhere … tweeted M. J. Zarif, the foreign minister … We finish his sentence: except in Iran. Many dream of an end to the Islamic Republic of Iran. However, would the men in a utopian Republic of Iran do better than now? We should ponder on it. Sadly, there is no counterbalance to Tehran’s clerics and no opening for writing a new chapter in Iranian history for now. However, even if the Iranians have no idea how to shape their future, surely the clerics will have no part in it. Rouhani in his flight back to Tehran heard a little voice: For you, at least, the game’s over. He is a future ex-president to be sacrificed to the Glorious Islamic Republic of Iran and the Victorious Islamic Revolution of 1979.